The Elantra sedan and coupe are very closely related under the sheetmetal; the new Elantra GT hatchback is less so, as it's shorter overall, has a shorter wheelbase, and a different interior, but nearly the same interior room and performance. Civic who? Corolla what? The Hyundai Elantra's one of the new standard bearers in the compact class, with 38-mpg fuel economy, better safety, and class-leading standard features. The Hyundai Elantra came out of nowhere in the 2011 model year to become one of the best-selling and best all-around compact cars available in the U.S. today. 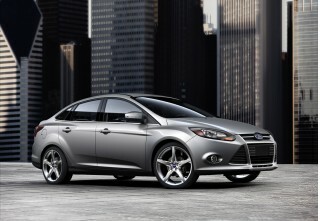 It's better than the Toyota Corolla, many of the Honda Civics, and a worthy competitor for the Ford Focus and Chevy Cruze. 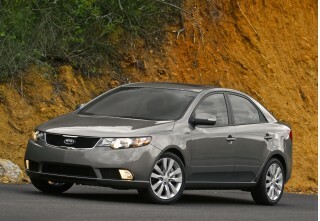 In fact, it was named 2012's North American Car of the Year. Now offered in sedan, coupe and five-door Elantra GT hatchback guises, the Elantra is more than just a car. It's an example of how quickly South Korea has learned from Japanese automaker successes and rewritten their playbook. The Elantra's an excellent value on many fronts. By its spec sheet, it's a mid-size vehicle, and it shows. The sedan's front seats could use a little more bolstering and lateral support, as in the coupe, but on either, they're surrounded by ample space in all directions. In back, the leg room is fine for adults, but head room can be tight, even for medium-height passengers. Coupes don't have a simple single-lever arrangement, which makes it a bit futzier to get into the back. The rear seats fold forward easily, if not completely flat, and that allows longer objects to be loaded into the relatively large, wide trunk. The Elantra's interior has lots of useful cubbies and storage bins, including a covered one that sits ahead of the shift lever: it also contains the aux jack, a power point, and the USB port in an easy to reach module, perfect for connecting smartphones. The space is wrapped in a shape that's visual shorthand for the company itself: more accomplished and interesting than ever. More fluid than the bigger Sonata, and more accomplished and refined too, the Elantra two- and four-doors slice their way through the field of dull-looking compacts with even more authority than the tight Focus and honed Dart. Calling it the best possible evolution of Pontiac, had it lived, wouldn't be an insult: the way the Elantra sedan's rear quarter panels mimic the lightness of the last G6 can't be lost on GM, which now has the handsome but staid little Chevy Cruze to sell. If anything, the Elantra's cockpit's a little more daring than the exterior, with the hourglass of the center console a defining shape that just happens to function perfectly as a comfy knee rest. Hyundai pared weight wherever it could to keep the Elantra lean and efficient. The effort paid off with a body that weighs less, and with fuel economy that rose to a magic marketing number. The previous Elantra's 2.0-liter four is down to 1.8 liters in this generation; with 148 horsepower and 131 pound-feet of torque in all, the Elantra performs smoothly and respectably with either a six-speed automatic or a six-speed manual. The Elantra doesn't feel as energetic or engaging as the Ford Focus, though, because its throttle is slow to respond to inputs, and its steering--while improved with better on-center feel this year--isn't especially natural in its feedback. It's a bit better on coupes, which get a faster ratio, along with a stiffer rear suspension and distinct tuning. Ride quality is good on either model, and the Elantra soaks up road noise as well as, or better than its competitors, with noise levels about as low as some mid-size sedans. That's an important metric for the Elantra, since its interior space spills over into mid-size territory, even as a two-door. All Elantras come with those features, and others that make it one of the best-equipped base vehicles in the segment. Even the base GLS sedan and GS coupe have power windows, locks, and mirrors; keyless entry; and (on automatic models) air conditioning; cruise control; and telescopic steering. Options can turn the Elantra into a luxurious vehicle; the navigation system has one of the largest LCD touchscreens in the class, and it's beautiful to look at and to use, with voice recognition for phone, audio, and and destinations, plus real-time traffic and weather. Bluetooth and audio streaming are standard, too; a rearview camera comes with the navigation system, and to top it all off, the Elantra four-door earns the IIHS' Top Safety Pick designation and now, the NHTSA's coveted five-star rating for crash safety. No more bland cars: the Hyundai Elantra crashes the Civic/Corolla party with daring looks and a cockpit almost without straight lines. A major milestone for Hyundai's rising reputation for styling, the Elantra sedan and coupe share the "fluidic styling" theme, but skip the awkward passages that are easy to pick out on the otherwise striking Sonata. The Elantra's almost perfect in its execution, more smoothly rendered, more clearly detailed than its mid-size companion piece. From almost every angle, the Elantra sedan looks like it's already in motion, usually a sign of good car design. It's aggressive, more athletic than the Sonata, and a complete opposite to the previous Elantra--with the rear door cuts particularly effective cues that seem to pull the shape taut for release, like a slingshot. The level of detailing for the Elantra's exterior is particularly noteworthy. Up close, the front marker lights extend to a point almost directly over the front wheel center—and to the front of the cowl—and the windshield that looks like it might possibly be the steepest of any small car. Take another step back and there's an entirely new dimension—as the deep crease from beside the headlamps softens as it continues all the way to the C-pillar and that prominent, rising shoulder line emerges from smooth sheetmetal just inches behind the lipped wheelwells. The coupe's almost as spot-on: it reads thicker than the Honda Civic Coupe, and some of the thickness hits at the rear end where the sedan is at its most dramatic. The coupe does get some touches unavailable on the sedan, like a small decklid spoiler, dual exhaust tips, and on the SE, glints of piano black on the grille. The wins logged by the sheetmetal are matched by some great execution in the cabin. The unfettered swoops of the exterior are toned down in the right way; the curves are there, just pulled in more compelling and cohesive ways. The pinch point where the center console meets the rest of the dash is brilliant: the hourglass shape isn't just fresh and distinctive, it's a perfect niche for resting knees that usually get a hard ridge and no apologies. It's just one cue in a design from a brand that's had few visuals all to itself in the past. It's an effort that brims with confidence. 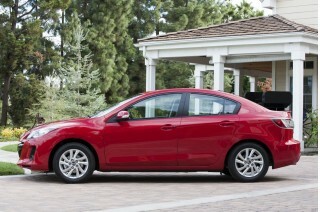 Athletic it's not, but the 2013 Hyundai Elantra has confident road manners--and 38-mpg gas mileage. 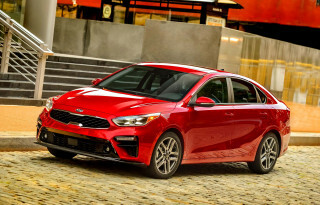 In reaching for a 38-mpg EPA highway rating, Hyundai trimmed the Elantra in some key but relatively unnoticeable ways that boost performance slightly, without pitching the Elantra completely into the sharp-handling niche occupied by the likes of the Ford Focus. The four-cylinder's down from 2.0 liters of displacement in the last-generation car, to 1.8 liters. Still, power's more than acceptable, with acceleration equal to or better than the prior version. Likely, that's because this Elantra sedan weighs about 60 pounds less than that pre-2011 model--it's just about 2700 pounds in base form, coupe or sedan. Hyundai's also steered clear of adding expensive, weighty technology on the engine--tech like direct injection or electronic throttle control. Even so, the Elantra has a smooth idle, and stays silky throughout most of the rev range, an achievement that eludes larger four-cylinders and wasn't particularly a Hyundai forte in years past. In the Elantra, the four's right at home in the 2,500- to 4,500-rpm range—where it'll be pretty much whenever you're increasing speed with the responsive six-speed automatic transmission, which will be far more popular than the perfectly fine six-speed manual. Manuals get an ECO shift light, while automatics have an Active ECO mode that slows down shifts and throttle to boost fuel economy up to 7 percent. The Elantra doesn't feel as energetic or engaging as the Ford Focus, though, because its throttle is slow to respond to inputs, and its steering--while improved with better on-center feel this year--isn't especially natural in its feedback. The wandering common to first- and second-year Elantra sedans has mostly been filtered out, too. 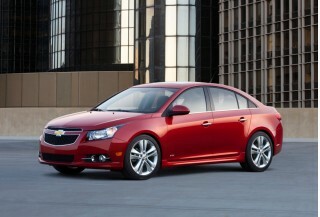 The coupe's slightly better for overall feel, since its electric power steering gets a ratio that's a bit quicker. There's also a small but noticeable handling distinction between the two body styles. The Coupe's rear suspension is an improvement on the sedan's: it's a V-shaped beam with more rigidity than the four-door's straight beam. On the other hand, ride quality is sporty without feeling overly firm in either body style, and the Elantra comes with standard four-wheel disc brakes and a firm pedal feel--better than the cost-cut rear-drum setup that's now so common in this class. It's a little shy of the performance paradigm set by VW, Mazda and Ford in this niche, but the Elantra feels at least as good as the current Civic. Impressive interior and trunk space complements the Elantra's above-average interior materials. It's a mid-sizer, if you're going strictly by the spec sheet, but the Hyundai Elantra's pitched as a compact, against other compacts. Still, it's exceptionally roomy in front, whether it's a coupe or a sedan. The generous proportions are put to good use, though. In the front seats, leg and head room are fine for even large adults. The sedan's seats are ready for a round of improvements: we'd like more bolstering and more bottom-cushion support, and some more length on the bottom cushion for long-distance touring comfort. Some versions have seat sculpting that suggests support, but it's not firm enough to provide. The Coupe's seats have those unique bolsters and decent support across the bottom cushion, and good comfort on the backrest. 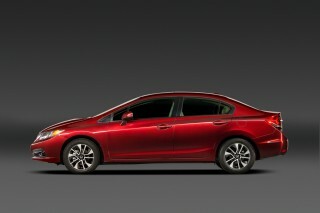 The leaner head room in the sedan's back seat gives it away as more Focus than Fusion, more Civic than Accord. The Elantra's no worse than most in the class in this respect--Volkswagen's Jetta is the standout here, with its outsized rear accommodations. But the coupe actually has more space than the Accord and Altima coupes. Leg room's good in the back seat of either version, and it's simple to slide into the four-door's back bench; clambering into the rear of the coupe requires a manual fold of the seatback and a separate slide of the seat itself, two motions that could be combined with one lever. The Elantra gets kudos for offering rear-seat heaters in the sedan, a first in the segment, but it lacks air vents for warm air from the car's climate control system--again, like most vehicles in the class, and some larger vehicles, like the VW Passat. The rear seats fold forward easily on either version, and that allows longer objects to be loaded into the relatively large, wide trunk. We like how the two easy-release pulls are within easy reach; the seats don't quite fold flat, but there's enough of an opening for fitting gear or tools for a trip across town. Throughout the interior, you'll find plastics that are about par for the class--a mix of hard, scuff-resistant and soft-touch surfaces--and there are lots of useful cubbies and storage bins, including a covered one that sits ahead of the shift lever: it also contains the aux jack, a power point, and the USB port in an easy to reach module, perfect for connecting smartphones. The leather that's available on sedans is perforated in a wave pattern and won't be mistaken for luxury hide, but it feels supple enough. The Elantra soaks up road noise better than most small cars (in part because of its soft suspension calibration), and at 70 mph it's not much different than in a four-cylinder mid-size sedan. Its crash-test scores improved this year, the Elantra earns top scores in both federal and insurance-industry tests. The Hyundai Elantra sedan received some running improvements in calendar-year 2011--at the time of its last major redesign--that improved its crash-test safety in the Feds' eyes. In the 2011-2012 model year, the Elantra received four stars overall from the National Highway Traffic Safety Administration (NHTSA). It managed just three stars in the frontal-impact tests, with five-star scores in side-impact and rear-impact tests. Hyundai says running changes to the design of its airbags, made in late May and June of 2011, give the side-curtain airbags and the passenger-side frontal airbag better inflation characteristics. That in turn leads to more head protection in accidents--and in crash tests. As a result, some 2012 models and all 2013 Elantra sedans now are rated by the NHTSA at five stars overall, with a four-star score for frontal impacts. In testing over at the Insurance Institute for Highway Safety (IIHS), the Elantra sedan earned the Top Safety Pick accolade, including top "good" ratings in all categories of testing--including the new roof-strength test. Although an 'acceptable' result in the new small overlap test gave the Elantra room for improvement in the IIHS battery of tests, too. The Elantra Coupe has not yet been tested. Among budget-priced compact cars, not all safety equipment is always standard (stability control, for instance is sometimes optional in this class). But it's all here and standard across the model line, coupes and sedans alike: stability control; anti-lock brakes with Brake Assist; a new Steering Effort Assist system that helps steer you back toward stability and control in a skid; front seat-mounted side airbags; and front and rear side-curtain bags. A rearview camera system is also available, although outward visibility is quite good in the sedan, slightly impaired in the two-door as a result of its sloping roofline. Base Elantra sedans are a tremendous value; leather-lined Limiteds are there for the must-have crowd. The Elantra can't claim the best steering or the most exotic user interfaces in the segment, but among compact cars, it's a striking value, with standard equipment that makes more expensive versions look less necessary. The base Elantra GLS sedan has a very complete list of features. It includes power windows, locks, and mirrors; cruise control; an AM/FM/CD player; a USB port; keyless entry; and on automatic-transmission cars, air conditioning and telescoping steering. Bluetooth is standard, too. A step up brings the Limited version. It gets the full luxury treatment, with leather seats; heated front and rear seats; a sunroof; 17-inch wheels; fog lamps; and turn signals mounted in the mirrors. On the Limited, a Premium Package adds an upgraded audio system; pushbutton start with a proximity key; and a navigation system, which is available separately on the base GLS. To help make the assembly and ordering process simpler, the new Elantra sedan is being offered in a limited number of build combinations. The downside of this strategy is that there are holes in availability of popular features. You can't get the navigation system if you want a manual transmission. The telescopic adjustment is optional on manual-transmission cars, bundled in as part of a Popular Equipment Package. 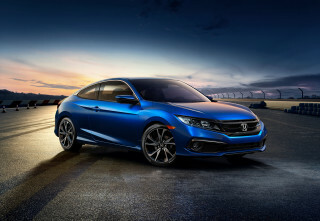 As for the Coupe, it comes in $18,220 GS and $20,520 SE versions, standard with a manual shifter, with an automatic transmission a $1,000 choice on either. The Elantra Coupe GS sports standard 16-inch wheels; satelllite radio; USB port; air conditioning; cruise control; Bluetooth; tilt/telescoping wheel; heated front seats; fog lights; and a split/fold rear seat. The SE adds 17-inch wheels; a sport suspension; a power sunroof; aluminum pedals; leather seats and trim; and a rear spoiler. There's a Technology package of options for the SE that adds a navigation system; a rearview camera; a 360-watt audio system; automatic headlamps; and automatic climate control. All told, a fully loaded Coupe goes out the door for $23,870. If you're in need of directions frequently, the Elantra's navigation system has one of the largest LCD touchscreens in the class, and it's beautiful to look at and to use, with voice recognition for phone, audio, and and destinations, plus real-time traffic and weather. A rearview camera comes with the navigation system, too, and it also builds in XM NavTraffic, NavWeather, Sports and Stocks integration, 16GB of onboard flash memory, audio streaming and satellite radio capability, and the capability to play JPEG or BMP slideshows from thumb drives. All Elantra sedans are rated at 38 miles per gallon highway, manual or automatic; coupes run slightly lower numbers. The Hyundai Elantra sedan has an edge in its family, with better gas mileage than its coupe and hatchback kin. The Elantra sedan carries a 38-mile-per-gallon EPA highway rating across the board. It lacks a specific model with aero improvements to reach the 40-mpg bogey; its competition offers special versions with aerodynamic and powertrain tweaks to hit the magic marketing number. The one major tradeoff for the diet that the Elantra was placed on, to optimize mileage, is that there's no spare tire--not even a porta-spare. That 38-mpg figure alone makes the Elantra sedan a green car, but the sedan's city number of 28 miles per gallon gives it a blended fuel economy of 32 mpg, higher than many subcompacts, even. You'd have to check out some hybrid models--the Prius, the upcoming Ford Fusion Hybrid--to get better economy with gasoline, or VW's diesel Jetta and Passat. Whether you classify them with the sedan or as separate vehicles, two new Elantras just barely miss the 40-mpg bogey. 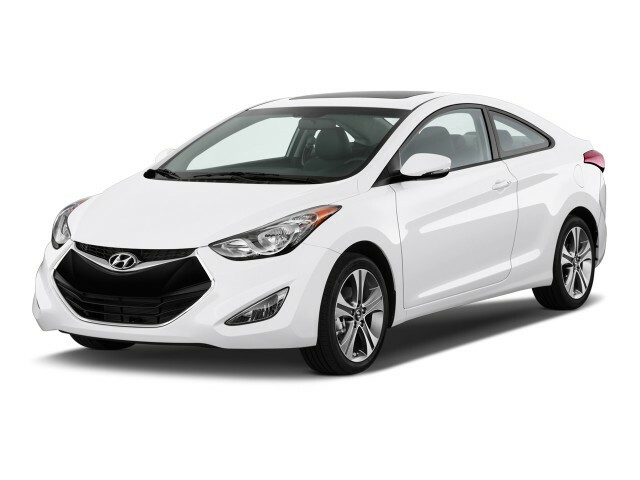 The 2013 Elantra Coupe, is rated by the EPA at 28/38 mpg with the manual transmission, but gets 27/37 mpg on the EPA cycle when it's fitted with the automatic gearbox. 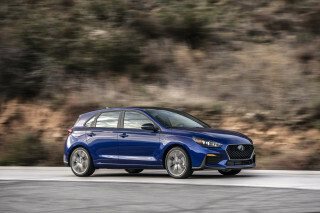 There's also a sporty Elantra GT hatchback, reviewed separately, which is estimated at 27/37 mpg with the automatic shifter, and 26/37 mpg with the automatic. In either case, those models are near or at the top of their competitive classes for gas mileage. There has been some controversy over real-world mileage of the Elantra, with some owners claiming that they haven't been able to meet the EPA numbers. We've noticed numbers that are in the same range as those of other vehicles in this class--about 34 mpg combined in an extended drive, exceeding the EPA Combined rating by 1 mpg. And we've seen close to the EPA highway rating in a real-world Interstate cruise. NOTE: The Elantra is one of several Hyundai vehicles found to have misstated gas-mileage ratings. A consumer group's complaints over lower real-world economy have led to an EPA check of Hyundai's self-certified numbers--which in turn has led to lowered official ratings from the original 29/40-mpg numbers. Owners can register with Hyundai to receive reimbursement for the gas consumed above and beyond expected levels; more details are found at HyundaiMPGInfo.com. nice! was what I wanted at the time. Gas mileage was supposed to be better, though. Very dissatisfied with the car, thinking about bringing back and leave on parking lot !!!!! Adequate, nothing about this car makes me want to drive it. Great car, however lacks get up and go! Fantastic quality value and style! `Everything you could possibly want in a vehicle. It drives like a dream, is very responsive and since it has all the bells and whistles there is no reason for it not to be awesome.